The thought of it would chill most people to the bones. But for Rory Fitzgerald, there is no better challenge than swimming in a pool that’s been created in a frozen lake with a water temperature of 0.8C – and an air temperature of minus 10C. Now he’s in training for the International Ice Swimming Association World Championships later this year. Here, Rory, 60, of Hampshire, explains why he gives a warm swimming pool the cold shoulder. A decade ago, I made the transition to open water swimming. I swam the Channel in 2013 in a time of 12 hours and have been seeking steadily colder swimming challenges ever since. Ice swimming has taken me to competitions both at home, across Europe and as far as North East China. I even took on the challenge of an ice mile inside the Arctic Circle in northern Norway. Now I’m preparing myself for the third International Ice Swimming Association (IISA) World Championships in Murmansk, Russia, in March. What is the International Ice Swimming Association? The International Ice Swimming Association, was founded in 2009 with the objective of formalising swimming in “ice” conditions, establishing rules and safety requirements and providing accreditation for swims and swim records. By last December, the IISA had formally recognised 412 “Ice Miles” completed by 276 swimmers worldwide. An ice mile is an unassisted swim of at least 1,609.3m in water of 5C or colder, wearing only the basics of swimsuit, hat and goggles. My competitive ice swimming journey began there. Back in 2015, the IISA held the first World Championships, which attracted 50 swimmers from around the globe, half of them coming from the host nation Russia. The ice kilometre is an extreme swimming event in which the added racing element must not be underestimated. Competitors pit themselves against the elements and each other. Swimmers are led out from the muster area onto the ice and are invited to disrobe and enter the water. Diving is not allowed for safety reasons. The cold air and biting wind, however, is nothing compared to the burning cold of ice water. Muscles stiffen and tendons feel as taught as piano wire as the referee checks all are in position and signals the start. The first flurry of strokes allow your face to adjust to the temperature and the initial rapid gasping to subside to a more measured and controlled rhythm. Swimmers all find their pace and are conscious of the steady loss of sensation in fingers and toes. At Murmansk, the 25m pool was cut into the frozen surface of Lake Semenovskoye, with water measured at 0.8C and air temperature of around minus 10C, although, on the day, a solar eclipse caused the temperature to drop further. Strangely, my swim seemed to get easier and, at the halfway mark, the possibility of achieving a finish became very real even as coordination deteriorated and the lane ropes themselves became a navigational hazard. Then, with just a few lengths remaining, all doubts about completing the distance gave way to the more familiar desire to finish hard and smack the wall ahead of my rivals. I completed the distance and learned a very valuable lesson. In open turns you reach out to grab the edge of the pool to pull yourself around. The edge was several inches deep in snow which was relentlessly being replenished. I made all 39 turns using my right hand and suffered the consequence – cold damage to my fingertips which took almost nine months to resolve. I now try to alternate each turn. The end of the race is far from the end of the swim. Still gasping from the final exertions, swimmers are led into an assessment room and, following a brief check, are released to the recovery crew. What follows is the least comfortable part of the event as a team of well-drilled attendants wrap and replace steaming hot towels around your shoulders and waist whilst keeping hands and feet cold in buckets of water. As soon as feeling starts to return and shivering begins to take hold, swimmers are ushered along to the warm embrace of a sauna – and with recovery the event is complete. 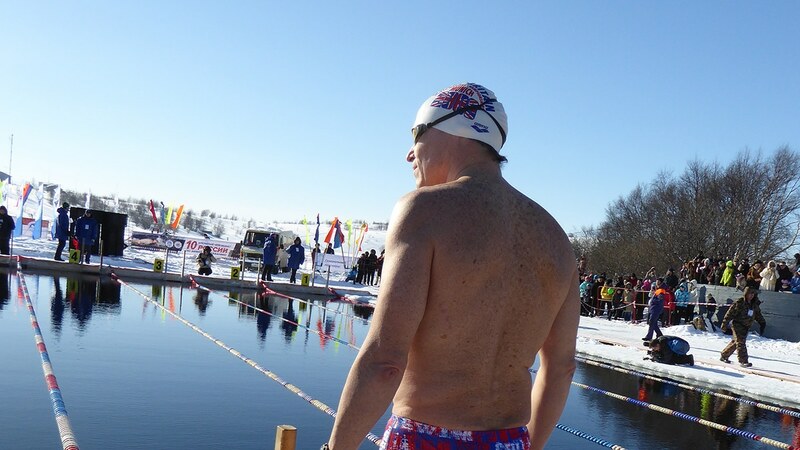 The sense of achievement and euphoria following my swim in Murmansk persuaded me to keep at it. The enormous increase in popularity means that there is now a well-established circuit of national and international events with distances from 25m to 1,000m. The third IISA World Championships will be held again in Murmansk in March this year. The event has trebled in size to 150 places in the 1,000m and IISA has allocated these across the 70 or so affiliated country associations with 10 places going to Great Britain. I received confirmation of my place last November. Training in the lead up to the ice swimming championships is to prepare for the initial cold shock, the management of cooling and the experience of re-warming. It is impossible to emulate the effective Russian recovery procedures, so training has to avoid the extreme exposure that will be encountered in Murmansk. But it has to prepare us for it. Each year, my training schedule is broadly similar. I work on speed and technique in the pool with my swimming club, supplemented with regular acclimatisation swims in local rivers, lakes and the sea. However, water temperatures locally in Hampshire seldom approach zero degrees so, each winter, I take myself off to the mountains of Snowdonia or the Brecons to seek out half frozen lakes and tarns. It is important to note that ice swimming carries extra risk, particularly where a swim might involve a lengthy hike to a remote lake, far from any shelter, recovery facilities or emergency services. For this reason, I keep such swims short, only 10 minutes or so, depending on the temperature and exit the water long before I start to feel any adverse effects. I also swim with shore support, there to help uncoordinated hands pull on dry layers. Acclimatisation is just as effective and it carries a lot less risk than it might with longer swims. The acclimatisation has its rewards, though. Last year, I had the opportunity to swim in a beautiful glacial lake in Iceland, amongst icebergs. 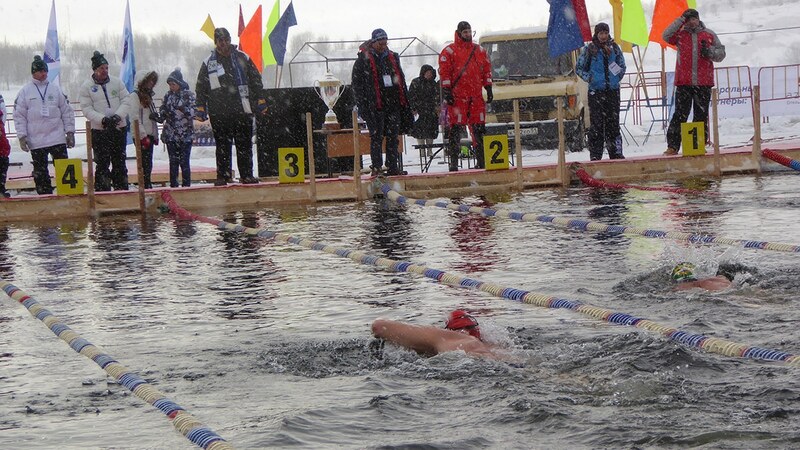 In December, I travelled to Tyumen, Siberia, to take part in the seventh Russia Cup of winter swimming and the first round of the IISA World Cup. Conditions there are very similar to Murmansk and, if nothing else, it promised to be excellent training. I took part in the 500m and several shorter events. Murmansk is now only three months away and, this time, the competition brings with it the added pressure of the prospect of an age group medal. My objective must switch from simply completing the event, to doing so whilst sustaining my best possible stroke and pace for around 15 minutes in the ice. Pauline Barker, who is one of only three people in the world – and the only woman – to complete 10 ice miles, has the following advice for anyone thinking of trying ice swimming for the first time. She said: “It does have its dangers – particularly if you have cardiac or blood pressure issues – so always be sensible and seek medical advice before starting. Cold water shock and afterdrop can both be significant and you need to learn what is ‘normal’ for you to feel in cold water. “Everyone is different but I don’t advocate taking risks and will always err on the side of caution. “For newbies, a rough rule of thumb is one minute in the water for every degree the water temperature is above freezing. “Always monitor how you feel and ideally keep a log of temperature, time in the water and how well you recovered. That way you can monitor how well you are coping and increase or decrease your cold water exposure accordingly.